The Wunderland is neither a grey conference room nor is it a perfectly white ballroom and it has a layout full of angles, nooks and crannies. This is why we believe it is the perfect location for a special event. You will hardly find a more unconventional location for an event than the Wunderland. Meanwhile we have rented 7,000 m² in the ancient warehouse district and besides the exhibition we have space for events, readings, meals, conventions, conferences and much more. You won't get square and pragmatic here but devotion and enthusiasm. We have been holding events at the Wunderland for many years and catered over 100 successful events, ranging from little conventions to big gala events with 500 guests. We have a lot of experience in keeping guests happy and meanwhile have not lost our joy for experimenting and meeting challenges. Basically there are three different possibilities to have an event in our house: you can either decide to visit us during our opening hours or after we officially close for the night. In addition, there is additional event space in our building available. We are happy to show you everything in detail on location or to send you additional information via eMail. An alternative, albeit highly recommended, are our own special events. A few times a month, we open our doors to a limited circle of guests for “A Night at the Wunderland” or the “Culinary trip around the world". These events are especially recommendable for small groups and small budgets. Feel free to come and visit us with groups of different sizes during our regular opening hours. Usually we are at least open until 6 pm, on Tuesdays even 9 pm. During the school holidays we open until midnight on many days. Since our opening hours vary, please check here for a specific date: opening hours. Our recommendation: calculate at least 90 minutes for your visit. We are happy to provide you with an individual offer. Contact us here! You would like to treat your guests to something special? Then an exclusive night after opening hours is the right option for you. Experience the Miniatur Wunderland exclusively and without time pressing. An exclusive tour through the site, a flying buffet or a great gala dinner - we are willing to make (almost) anything possible for you. You can also book guides that will lead you behind the scenes at different locations in the site and tell you interesting details and stories about the Wunderland. To discover all of the Wunderland, we recommend booking at least 90 minutes. The minimum time for a tour is 60 minutes. It can begin from 15 minutes after the end of the regular opening hours. You will receive prices and availability on application. Please fill out our contact form or call us. In the following, we have made some suggestions for types of events. Nevertheless, pleasedo not hesitate to contact us with your own ideas! You want to host a networking event or simply reduce the obligatory social cluster building at your party? Then our casual buffets might be the right event for you or your customer events including family. We offer smaller buffets or finger food for small groups or events of shorter duration. The food is freshly prepared in our own kitchen and will be served and presented on location inside the exhibition. We provide slip covered high tables to eat at. As an alternative your social function may be located in our specified event location (up to 60 people) or our bistro. These locations are equipped for sitting down for a meal. Should a larger number of children be among your guests we are happy to prepare an addi-tional, child friendly buffet or integrate child friendly choices into the regular buffet. You could, for instance, start the evening with a glass of sparkling wine. We serve German Sekt or you can choose from a variety of Prosecco, orange juice, beer and soft drinks. Should you be on a budget or just in a rather small group you could simply dine in our bistro during opening hours, it has a large variety of food and beverages. You prefer having your own caterer whom you normally work with? This is not a problem; we are not contractually bound to our caterer. Dine exclusively and experience the Wunderland at the same time - this is catering in a very laid back atmosphere. For example with our Culinary Trip around the World, which you can book exclusively for a minimum of 120 people. 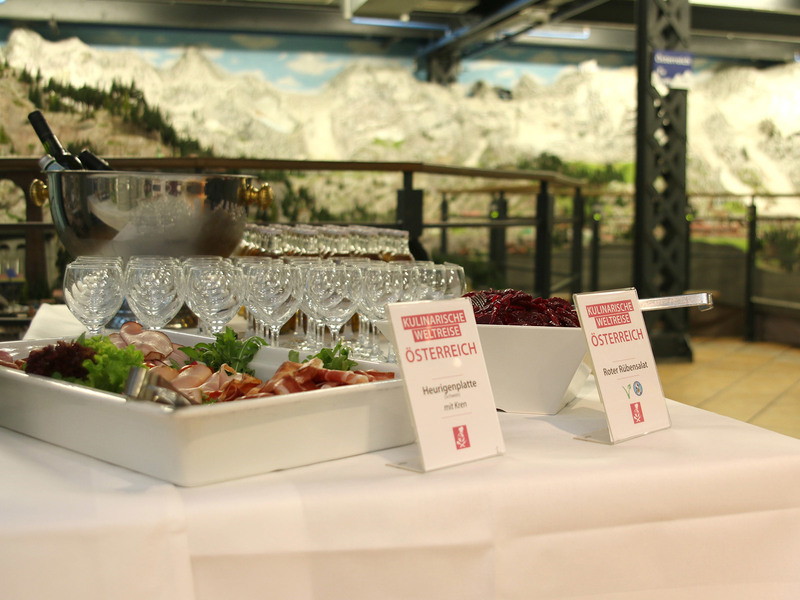 On six buffets with different themes directly within the model railway site, we present you with culinary delicacies and beverages typical for the different theme worlds on site. For smaller groups and groups with less time we can also offer smaller buffets or finger food, that can be served within the site. For dining we provide party tables with slip covers, unfortunately we can't offer seating for this type of event. Should among your guests be a larger number of children, we are happy to provide an additional children's buffet with child friendly food. You can start the evening with a reception, serving sparkling wine, prosecco, orange juice, beer or soft drinks. If you have to watch a budget or have a smaller group we can also recommend our bistro during opening hours with a wide range of foods. Please use our contact form or call Alexander Rostkowski at +49 40 300 6800 for more information. You would like to offer your guests a seated dinner with a buffet or a multiple course menu? Of course we can provide this for you. In our location there is additional event space belonging to our partner “Nordevent”. The space is big enough for 650 people and can be opened directly into the Wunderland. In our historic warehouse building, three floors are available to us, so we have the right size of event space for any group size. Our catering suggestions range from a rustic buffet, to maritime variations, to gala dinners or gourmet buffets. We also offer multiple course dinner menus. One of our partners is the VLET restaurant. We are happy to make you an individual offer. Of course you can combine this with a visit to the Wunderland, either during opening hours or exclusively after hours. Should the event floor be occupied or should you need space for an even bigger number of guests, we are cooperation partners with the main customs office, they have a space for up to 900 people. Please contact us via our contact form or call Alexander Rostkowski at +49 40 300 6800. There is always the possibility for smaller groups (up to 30) to have coffee and cake, fresh pasta, salad, Schnitzel or Currywurst at our bistro - comfort food for a smaller budget. Located on the Sandtorkai, a gourmet restaurant with typical Hamburg cuisine in a nouvelle interpretation. Hamburg's oldest inn was first historically mentioned in 1260. It has barbecues at the tables. These restaurants offer a variety of possibilities for buffets or menus. Depending on the group size and availability extra rooms can be rented exclusively. Hamburg without its harbor is unimaginable. Therefore, we recommend combining two great Hamburg events into one: Charter a boat through us or a little ship and discover the harbor and the Speicherstadt ancient warehouse district via water way, exclusively and independent of the tides. The expert boat skipper will tell you a lot of knowledgeable things about the harbor, the city and of course the ships. But watch out: skippers have been known to tell a tale or two. If you like, one of our guides can tell the story of the Wunderland as well toward the end of the trip. There are several boat stations close by and we can organize boats and barges with a capacity of up to 500 people, depending on availability. Among them is the barge of the Hamburg senate. All barges and ships have lavatories on board and during the colder seasons the inside is heated. There is an outside deck on all boats as well, and beverages can be purchased. Please contact us via our contact form or call Alexander Rostkowski at +49 40 300 6 800.